These photos are from an inspection 2 days ago. I could not believe my eyes. 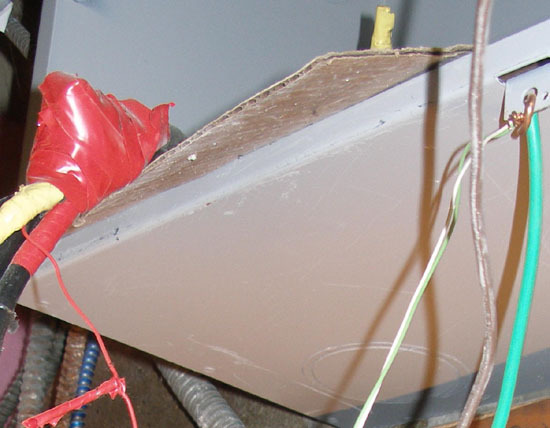 They include a receptacle tied into the Service lateral in a CT cabinet (3/0) wire ahead of the main, and you will notice the conductors are wrapped around the lock hasp of the cabinet for the "ground/ neutral connection. The real mess is this is "bell wire - 18 gauge. One couldn't even make that crap up. Unreal!! Former city inspector in Chicago [Hogan] told me years ago the only thing he didn't understand about electricty was why more people didn't die from it each year. If it was easy, anyone could do it. There is an old sarcaastic saying " God looks out for fools and idiots"
When I see junk like this I believe it more and more. The bad part is that so many get away with stuff like this and that make too many joe fly by nites lowball the rest of us who work to code. I don't see a problem. The 18 gauge wire is the fusible link. yikes!! We owned a rental house some years ago. We later discovered the last batch of tenants had added some outlets. Yes, you guessed it. All 'new' circuits were wired with 18 gauge doorbell wire. 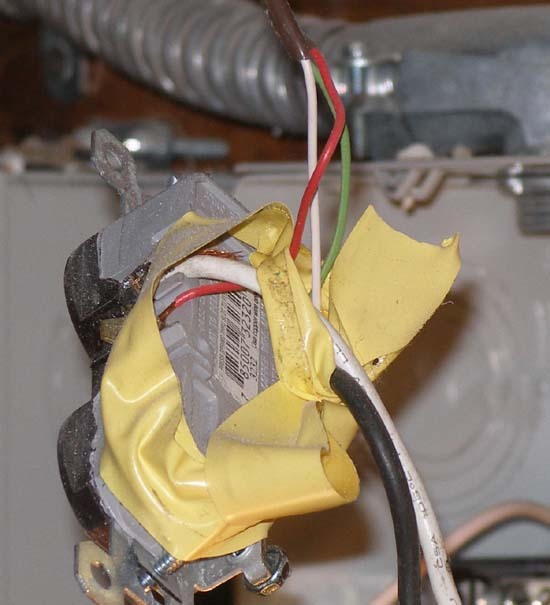 I've heard that the NFPA is relaxing their bonding/grounding techniques and requirements...but I think that's gone a bit too far. Anyone else notice that the 12(?) guage leads coming off that recept are connected white hot, black nut? Fusible link, good one, RSmike! I'm also surprised that the lock hasp provided an adequate path for neutral/ground. No signs of arcing that I can see. That nice piece of cardboard in the first pic. helps to eliminate those nasty arc-fault-to-ground events. What is the AIC rating of doorbell wire, anyway...? "fusible link..." - thats a zinger! That's a beauty you've found there. Yes I agree, a nice cheap bushing against those nasty sharp panel edges. What was underneath that red and yellow tape conglomeration, in the top pic?.